Try Maybelline Instant Age Rewind Eraser and get rid of your dark circles. The formula is specially adapted for the eye area. Try it now, you'll love it! 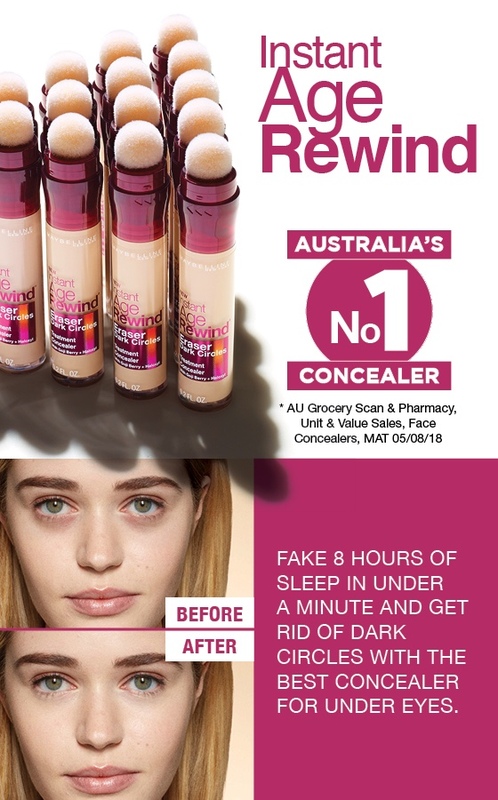 • Dark circles erased in one swipe! Maybelline Instant Age Rewind Dark Circle Concealer - Light is rated 4.7 out of 5 by 45. Rated 5 out of 5 by NikitaJ from The best concealer time and time again The perfect concealer for under eyes. Have tried and use multiple brands from Nars to all chemist brands and this repeatedly has the best finish. I have olive skin, yellow undertone and a mum of 2. 34yo so skin can be quite dry, darkness defiantly there and wrinkles growing in number. This is light enough that it doesn’t set into wrinkles, doesn’t look cakey, blends into skin. i don’t need to set it. Perfect for everyday and perfect price. I easily use it everyday. Rated 5 out of 5 by gracepm from Hides dark circles and isn't cakey at all. A thin concealer that works to remove dark circles well, but doesn't layer on too thick. Rated 5 out of 5 by MD88 from So smooth I love this concealer. It goes on so smoothly and the sponge applicator is perfect. Great coverage that you can build on too.